Another week is gone, and the weather did not surprise us pleasantly with spring as we expected. Nevertheless, I will surprise you with another offer for a relaxation in a beautiful and pleasant place. This time I chose the cozy villa “Color” only 6 km away from the beautiful town of Troyan, known for its rich historical and cultural heritage. The place grabs you with its incredible nature and peaceful atmosphere. 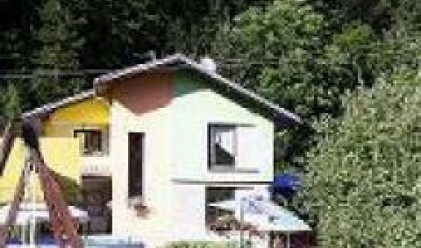 Villa “Color” can accommodate 10 people so if you choose to go there, don’t take the neighbour with his three kids, their friends and the dog with you. Otherwise, traveling to the place is worth it because it’s perfect for anyone looking for some nice, quite and peaceful corner of Bulgaria. Don’t think that, because “Color” is so calm and peaceful, it has no telephone, no TV set, no anything to entertain you. Absolutely not true. Besides all this, the villa also has internet access for the kids, who can’t do without their games, and teenagers, who don’t want to be away from their chat friends. Oh, and not to forget one of the most interesting things in villa “Color” – a fully equipped kitchen at your disposal anytime you decide to give vent to your culinary genius or to challenge your better half in a culinary duel. Of course, for those who prefer to relax and don’t have any intention to go to the kitchen, the kind hosts have the best specialties. Something for everyone, as they say. And villa “Color” has everything: even cars, bikes and ski for sports fans. For the lovers of fine wine, fine appetizers and other culinary temptations, the villa offers many degustation events. Of course, if the weather is good, the guests of the house can enjoy the pleasant mountain sun and the pool in the yard of the villa full of bright flowers. If you have enough energy, you can go into a bigger adventure – riding a horse around the area, which is sure to make you forget all problems because, if you are a beginner, believe me, you will only think how to keep your hands on the reins and if the horse will listen to you. It’s time for the most interesting part – prices. A single room in villa “Color” costs 35 leva, and for a double room with a bedroom or two single beds you will have to pay 50 leva. Don’t forget to ask for your breakfast, because it is included in the price! If despite my recommendations in the beginning you decide to take your neighbours with their three kids, friends, and the dog, then you can hire the whole villa for the modest price of 150 leva. Not to forget – there are discounts for kids. I know you can already see yourself lying on a beautiful meadow filled with fragrant flowers or riding a horse, then enough talking – pack your bags, start the car and … have a nice trip!